Ryan O’Reilly has become one of the NHL’s top new young players that has a great chance to become one of the best players in this decade. Not only has Ryan O’Reilly played good in the NHL, but he has also played very well for team Canada. Ryan O’Reilly has played for his home team Canada since 2008 and has played in 23 international games, while scoring 7 goals and accumulating over 20 points. Ryan O’Reilly is one of the youngest players in the NHL and is considered by several media outlets to be one of the best up and coming players in the National Hockey League. O’Reilly is also known as being a great teammate and hard worker in the off season. Below is a list of O’Reilly’s career stats throughout his hockey career. 2009-2010 SEASON: Ryan O’Reilly was drafted by the Colorado Avalanche with the 33rd pick in the 2009 NHL Entry Draft. Ryan O’Reilly is the youngest player to play for the Avalanche. At the start of the 2009 season O’Reilly made the starting roster. In his first pro season Ryan O’Reilly played in 81 games for Colorado. During his rookie season Ryan O’Reilly scored 8 goals and also added a goal in a playoff game. O’Reilly also had 18 assists which showcased his skills as a passer. Midway through the season O’Reilly was able to also show his defensive skills as his aggression and ice awarness made him one of the top rookie defensive centers in the NHL. O’Reilly helped lead the Avalanche to a playoff appearance during this season and was apart of a very competitve series with San Jose. In 2009, O’Reilly played in 6 internation games for team Canada and scored 2 goals while adding 3 assists. 2010-2011 SEASON: In 2010 Ryan O’Reilly once again showed his growth as a player in the National Hockey League. O’Relly played in 74 games while scoring 13 goals and having 13 assists on the season. O’Reilly also help the team defensiveley. After the second pro season Ryan O’Reilly became known as one of the top all around players in the NHL. O’Reilly also recieved many great reviews from fellow players and coaches. According to several NHL media outlets O’Reilly is a great teamate and very hard worker. 2011-2012 SEASON: During O’Reilly’s third season he continued to progress as one of the top players in the NHL. O’Reilly was considered one of the top defensive centers in the league and also improved his offensive performance. Ryan O’Reilly finished the 2011-12 season with a career high 18 goals and another career high of 37 assists. Reilly played in 81 games in his third season and was named the star of the week in late November of the season. 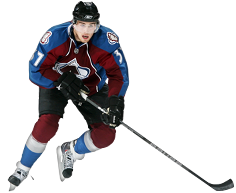 O’Reilly led the NHL with 101 takeaways and also set a Colorado Avalanche record in the process. O’Reilly also led the Avalanche in scoring. Despite his great year statistically, O’Reilly was disapointed that his team missed the playoffs for the second season in a row. O’Reilly always put the team first and felt that the 2011-12 season was a disapointment because he couldn’t help his team make the playoffs. Following the NHL season O’Reilly went to play for Team Canada. O’Reilly played in 7 games and scored 2 goals and had 2 assists. O’Reilly helped Team Canada finish 5th place in the World Championships. 2012-13 Season: O’Reilly was in contract talks with Colorado, but because of the NHL lockout, the contracts were on hold. While waiting for the lockout to end O’Reilly signed a deal to play with the Metallurg Magnitogorsk in the Russian Kontinental Hockey League. O’Reilly became a hit in Russia playing in 12 games and scoring 5 goals and adding 5 assists. After 12 games O’Reilly left the team because of an ankle injury. O’Reilly decided to rehab from his injury. The NHL lockout eventually ended and O’Reilly re-signed with Colorado. Due to the lockout and injuries O’Reilly started late with the Avalanche, but as of late has been playing back to his normal self. As of April 12, 2013 O’Reilly has played in 22 games scoring 4 goals and adding 10 assists.